If Easton Suburban Water Authority needs to enter your property to carry out work or for any reason other than those listed above, we will attempt to give you seven (7) days notice. Easton Suburban Water Authority employees will only enter your property between 8 a.m. and 4:30 p.m., Monday through Friday, unless there is an emergency, or you provide consent to enter, or Easton Suburban Water Authority has reasonable grounds to believe there has been a breach of the Water Act of 1989. 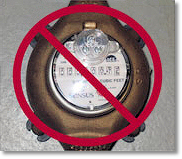 Tampering with your water meter in an attempt to use water supplied by Easton Suburban Water Authority without that water being measured and tracked through your water meter is a crime that is punishable by both fines and prosecution. If we determine that your meter seal has been broken as an indication of meter tampering, we will assess you the cost of all related expenses to replace your meter and repair any damages. In addition, we will issue you a bill for the water you have stolen. Your bill will be based on either: a) ten times the minimum charge for that size meter, or b) the estimated consumption for the billing period or periods in question. Because meter tampering is a crime, we also will file criminal charges against you for meter tampering. We consider meter tampering a serious violation of your contract for water service and will pursue prosecution to the full extent of the law. Unauthorized use of fire hydrant - Large increases in water flow through fire hydrants may cause discolored water for you and your neighbors. Only Easton Suburban Water Authority employees and authorized fire personnel may use fire hydrants. Unauthorized connection - A per day charge will be levied against any unauthorized individual who connects to the Easton Suburban Water Authority water system. Unauthorized water use - If you use water supplied by the Easton Suburban Water Authority water system in an unauthorized manner for any purpose, including the violation of any drought restrictions adopted by the Authority, ESWA will levy against you a "per day" charge for the use of that water. Unauthorized operation of the Authority's system - If you operate any part of Easton Suburban Water Authority's water system, including altering valves, curb stops, etc., you will be fined on a per incident basis. Unauthorized testing of private fire protection systems - If you need to test a private sprinkler system, standpipes or other fire protection systems, please contact our office at 610-258-7181 Monday through Friday, 8 a.m. to 4:30 p.m. If you attempt to test this equipment without permission from us, your testing will be considered an unauthorized water use, subject to a per day charge for the use of that water. In all cases, Easton Suburban Water Authority reserves the right to charge anyone responsible for an unauthorized use of water or Authority facilities with any and all expenses incurred in exposing, correcting and/or litigating violations, as well as damages suffered by the Authority or other parties as a result of the action. If you see an unauthorized use of water or unauthorized use of Easton Suburban Water Authority facilities, call our office immediately at 610-258-7181. 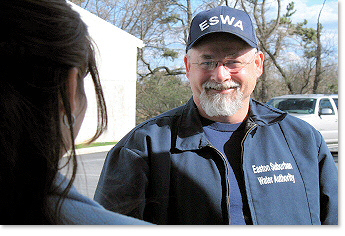 Our employees wear shirts or jackets that have the Easton Suburban Water Authority name and/or logo on them. Employees will identify themselves by name and produce appropriate identification upon request. Do not allow anyone into your home who claims to be an ESWA employee but cannot or will not produce identification as such. If you have any questions regarding an ESWA employee requesting access to your home, please contact our office immediately at 610-258-7181.